Sketch the equipotential lines in the vicinity of the negatively charged conductor in Figure 19.35. How will these equipotentials look a long distance from the object? Figure 19.35 A negatively charge oval shaped conductor. Please see the figure in the solution video. A long way the object would look like a point charge. Equipotential lines would be circles. This is College Physics Answers with Shaun Dychko. 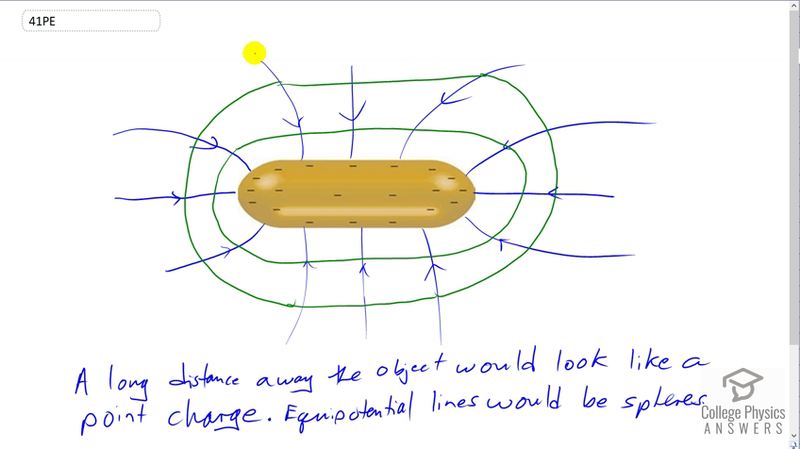 In order to sketch the equipotential lines, I first draw the the electric field lines cause I find that easier to draw these blue lines of electric field lines and they are all pointing toward this object because the object is negatively charged and they seems to be a… concentration of negative charges at the ends and so the density of the field lines is greater corresponding to the greater density of the charges on the ends and now with those lines been drawn it becomes easier to draw the equipotential lines because equipotential lines are always at right angles to the electric field lines and so we can surround this object with a green line that is always at right angles to the electric field lines and if you are long distance away, this object would seem to be a negative point charge and if you are really really far away, this horizontal length wouldn’t matter in comparison to the distance away and so it will seem to be a negative point charge in which case the equipotential lines would be spheres or well, to be more precise equipotential lines would be circles and equipotential surfaces would be spheres.